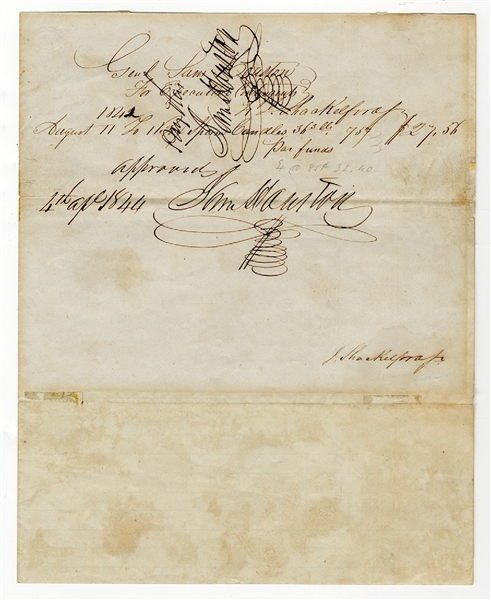 Document Signed, "Sam Houston," as President of Texas, 1 page, 8" x 9.75", [n.p. ], April 4, 1844 approving a purchase of sperm candles. Additionally endorsed over the top of the text by Houston, "Sam Houston." Light toning and soiling toward margins and in the blank portion, some minor marginal wear, minor tear only slightly affects one letter well clear of Houston's signature, partly separated fold repaired on verso, else very good. The document reads in full: "Genl Sam Houston For Executive Contingents to J. Shackelford August 11, 1842 To 1 Box Sperm Candles 36.3 lbs 75? $27.56 par funds." Below the text of the invoice, Houston writes, "Approved 4th Apl. 1844 Sam Houston" with his distinctive paraph. Over the top of text he again adds his bold signature ordering J. Shackelford to "pay this Sam Houston," again adding his paraph. Jack Shackelford (1790-1857) had served in the Texas Revolution as a commander under James Fannin. The Mexican Army, however, spared his life at the Goliad Massacre of 1836, likely so he could care for the Mexican wounded during the Battle of Coleto, which occurred eight days before the massacre at Goliad. (Shackelford's account of the massacre is considered by many to be the finest early account.) Shortly after this, Shackelford was sent to San Antonio de Bexar by his Mexican captors to care for the Mexican soldiers wounded at the Alamo. In 1842, during Houston's second presidential term, Shackelford again helped Texas against an invading Mexican army.